I saw an interesting post about the 开档裤 (kāi dàng kù). Bet you cannot guess what is it? I give you some hints. 1) This is an apparel for boys only. 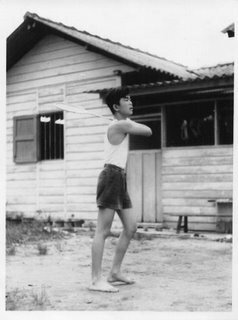 2) When we were kids in the kampong, my mother liked to play cards like 'say sik' (four colours) or 'tai chi' (大字??) with the neighbours; mostly housewives. I noticed that some of her friends were too busy to attend to their sons' "personal needs" (as we say in Industrial Engineering jargon). So they sewed this type of garment for their children (boys only). Thank goodness, my mum never forced us to wear such pants. Now I know why my sister often told his son to sit properly and don't 'open coffee shop'. Recently I visited the Chinatown Heritage Centre with my eldest brother and my friend Peh who is about my age. We saw many familiar objects such as this one below. Do you know what it is? In Cantonese we called it ‘woon kwai’ (碗柜). It is used for storing cups, bowls and other eating utensils. Can you see the bowls? The see-through ‘window’ is in fact made of wire mesh. The purpose was to keep out insects. This is because this cabinet was also used to store food leftovers. 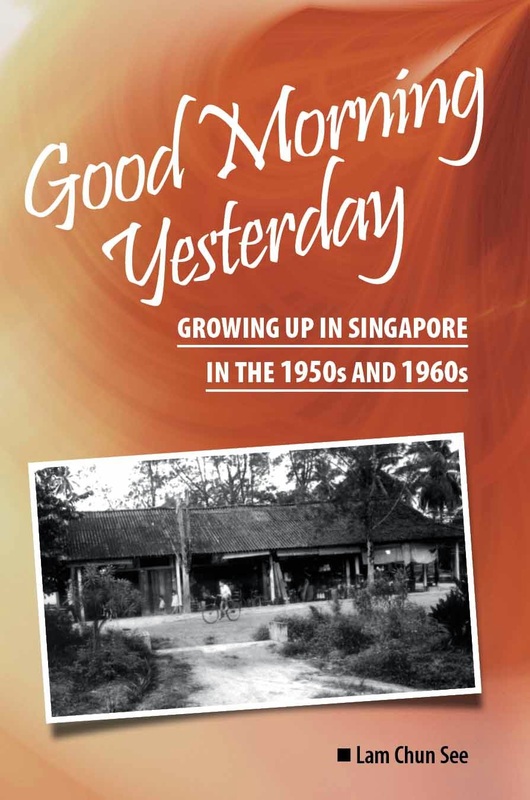 I am talking about the 1950’s when we did not have electricity supply to our kampong yet and thus we had no refrigerators. The purpose, as you have probably guessed, was to create a ‘moat’ so that ants cannot crawl up the cabinet to reach our food. Of course, this led to mosquito breeding. What we usually do, when we remember that is, was to scoop up the mosquito larvae to feed our fighting fish. (See my previous post). Anyway, mosquitoes were rampant and we would use this type of insecticide sprayer to spray Shelltox to kill them. I am curious as to whether my young readers have seen this before. Do you know how it functions? I remember studying about it in our physics lesson once. In Cantonese we called it ‘mun yau (蚊油) pump’. 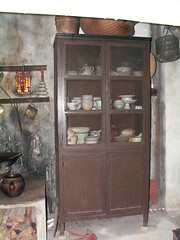 When electricity finally came to our village, one of the first electrical appliances that we bought was a refrigerator. I think the brand was Kelvinator. Have you heard of this brand before? It was very popular before the invasion of the Japanese brands. 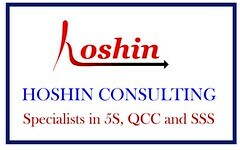 As usual, it was our more technically advanced cousins, the Ngs, who recommended us this brand. Remember the Minolta camera that I blogged about earlier? Well, that was also recommended by them. Maybe I should explain one more thing for the benefit of my young readers. Do you see the pot and kettle in this photo. Do you know what we do when these items are broken or worn out? Nowadays, we would throw them away of course. But back in the kampong days, we would get a tinker to repair (please don’t say you do not know what is a tinker). 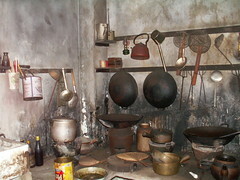 As kids we liked to watch the guy use a solder iron to repair the holes and cracks in the pots and kettle. This is another one of those extinct trades that the present generation probably have not seen before. Speak of solder, and they will probably think of printed circuit boards. Am I right? I hope you have gained a better understanding of life in the 1950’s after reading this post. More next time. No, my wife and I are too old to have babies. 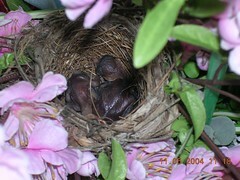 What I want to show you are photos of the Yellow-Vented Bulbuls that hatched in my neighbour's backyard in 2004. Knowing my children's love for animals, she alerted my kids who took these photos. Date of next 4 photos: 18 May 2004. Shortly after that, they flew off. NOTE: To get a better view, click on any of the photos and you will be brought to my phato album hosted at Flickr.com. Ever since I started blogging about these wonderful creatures, I have done a bit a reading up. 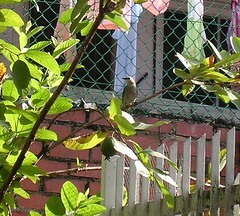 The name of this bird as you already know is the Yellow-Vented Bulbul. 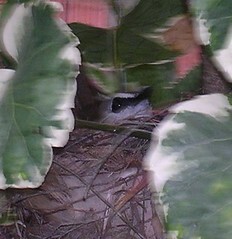 It is one of the most common birds in Singapore. They are found nearly everywhere except in the deep forest. Originally from the mangroves and coastal scrub, they have adapted to become one of the most common birds in cultivated areas (parks, gardens, and plantations).The success of the Yellow-Vented Bulbul is probably due to their wide ranging diet of both plants and animals. They are fond of berries and small fruits, especially figs and cinnamon tree fruits. They sip nectar, nibble on young shoots, and snack on insects. They forage in bushes and trees for berries and insects, and may even catch swarming insects on the wing. Yellow-Vented Bulbuls breed widely in Singapore in February to June. Courtship involves wing and song displays. They raise and lower the crown crest as they sing. 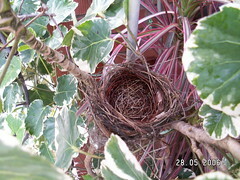 Yellow-Vented Bulbuls build well-camouflaged but flimsy, loose, deep, cup-shaped nests. They use grass, leaves, roots, vine stems, twigs. 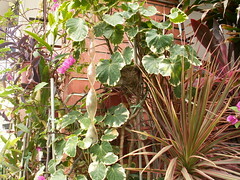 The nest may be untidy on the outside but are neatly lined with plant fibres. 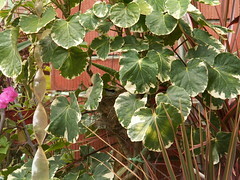 They nest in a wide range of places from low bushes, creepers to high trees. 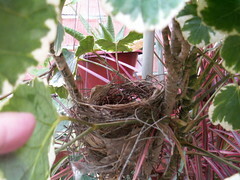 They are so used to humans that they may even nest in ornamental plants in residential gardens and even balconies! 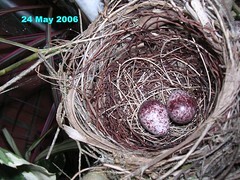 2-5 eggs are laid, variable in colour from white to pinkish, with lots of reddish-brown to lavender spots. Both parents incubate and raise the young. 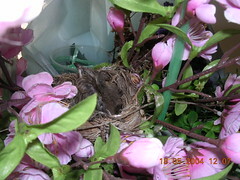 So sad to report that this morning, we discovered that the eggs have disappeared; and there are no signs of the bird. We simply have no idea what had taken place. Hope that they will come again. I heard from my children that last year, the same kind of bird laid some eggs in a nest in my neighbour's back yard just beside ours. On that occasion, the eggs did hatched successfully. I will see if they have any photos to share with you. Could it be that this bird(s) were from that generation? 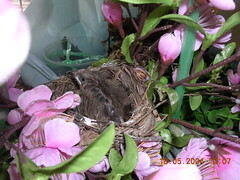 Here are another 2 photos taken on 24 May 2006. I notice that sometimes the bird faces a different direction. I am wondering. 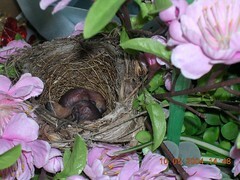 Are there 2 birds instead of just the mother. I understand from a similar post at Bird Ecology Study Group, Nature Society (What Happened to Yellow-vented Bulbuls Chicks) that both parents take turns to hatch the eggs. That story ended in tragedy. I hope mine has a happy ending. 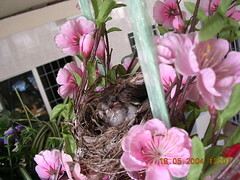 The photo below is of the front porch of my house. Do you see the potted plants next to the pillar? For some strange reason, a little bird decided to build a nest among the branches. Mind you this area has lots of human traffic. 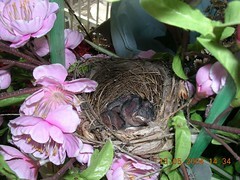 Each time we walk in and out of our house, or water the plants, we come within a couple of feet from this nest. Also, there is the noise from my car, plus the slamming of doors and so on. And guess what ... she decided to lay some eggs. 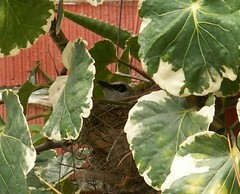 And here's our little feathered friend hatching her eggs. Can you spot her? I dared not go too near to take this shot. Too small? Ok - here's a blow-up. Question: Do you know the name of this type of bird? Shortly after this shot was taken, she flew away. But never mind, she will return. I will keep you posted of the developments in the weeks ahead. Look out for photos of the babies. Maybe I will make a slide show on Flickr later. Another question. 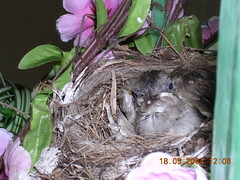 Have you ever considered how this little bird developed the knowledge and skill to build such a nest? How does she know the type and size of building material to use? Or the exact spot to build the nest? And the actual skill involved to put together the nest? Did she attend a training course and obtained a trade certificate? Did she undergo any OJT (on-the-job training) from her mother?. The National Heritage Board has organized a series of events to promote International Museum Day including, the Museum Hoppin' Trail. My friend at Yesterday.sg, Kenneth who went on a sneak preview, has posted some nice photos in his blog as well as in his photo album at Flickr.com. One particular photo caught my attention. 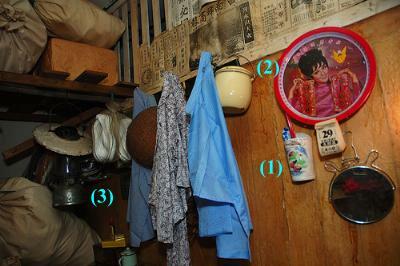 It showed several household items that we used to have in our kampong house back in the 1950’s. I would like to blog about three of these items. The first object is labeled (1) in the photo. Do you know what it is? It a chopsticks holder. It’s made of china. I wouldn't have remembered this without seeing this photo. The second item is a calendar. The metal frame usually has a picture of a famous actress or singer. When the year is over, you can use it as a serving tray for drinks. I doubt that you find such calendars anymore. But you can still find the horse racing calendar like the one here which I found hanging in my colleague’s cubicle. Many old-timers of my generation still liked to use this type of calendar. They like the big fonts as well as the dates of Singapore public holidays – apart from the important racing dates of course. When I was in primary school, I often waited eagerly for the end of the month to come around. Do you know why? I liked to use the paper to wrap my exercise books; with the clear side facing outwards of course. 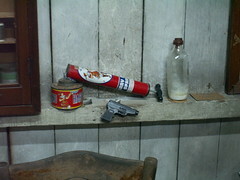 The third item in the photo is the pressure lamp. This type of pressure lamp was very common in the 50’s and 60’s. 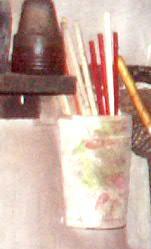 Many households had this type of pressure lamps and many pasar malam (night street market) stalls as well. In Hokkien, we called it ‘pong teng’. I am not too familiar with the operation of this lamp because I was too young then, but I liked to watch my father or my eldest brother light it up. Maybe one of you readers can do us the honour of explaining how this is done. Besides the pressure lamp, we also had the smaller kerozene lamp, the type with a wick (also called paraffin lamp). I think we did not have electricity in our kampong in Lorong Kinchir until around 1960. I know this because I recall one evening, when my father came back late from work; and while he was having his dinner in the dim light of this oil lamp, I had to recite my ‘times table’ to him. I was probably in Primary one or two at that time. So the year should be1959 or 1960. Electricity only came to our village after the PAP government came to power. 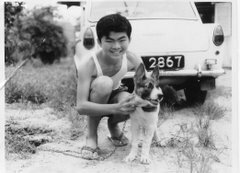 My eldest brother, Chun Chew, remembers Lee Kuan Yew visiting our village and promising us ‘upgrading’ in the form of electricity. The member of parliament for our constituency at that time was a Mr Tan Kia Gan. He was later replaced by a Mr Roderigo. My father served under him for several years in the CCC – Citizens’ Consultative Committee. Footnote: I found a website that gives a good explanation of the operation of a pressure lamp (here). 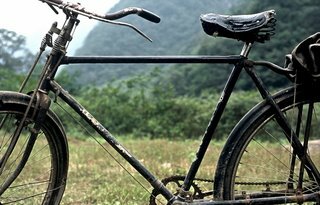 Today, I would like to share with you the technique that many kampongs kids of my generation adopted when learning to ride a bicycle in the 1950’s. I was inspired to blog about this when I saw this photo of kids cycling in Pulau Ubin when I visited this blog last week last week. (Pedal Ubin! Saturday, 13 May at Deadpoet's Cave) When I saw the kids with all their safety headgear, I could not help chuckling to myself and comparing it with our rather unsafe technique. Our technique had a rather obscene sounding name of Chng Kao Kang in Hokkien, which literally meant 'Crawling Through Dog Hole'. At first I thought it meant something vulgar. 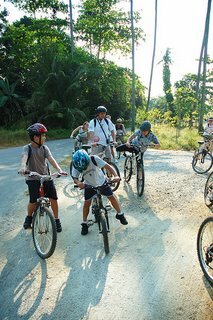 But when I checked with two of my middle-aged Hokkien colleagues, they assured me that it was simply a term that had been coined to describe the posture adopted by a kid trying to ride an adult bicycle. It resembled that of a (male) dog when it was peeing. It is a bit difficult to describe but I try. First, picture a boy about the size to those you see in the above photo. And then try to picture him riding an adult bicycle like the one below. No way right? Because the height of the horizontal bar is up to the boy’s chest level. So instead of crossing his right leg over the seat, he has to insert his leg below the horizontal bar. Basically, this is how it is done. 1) Hold the handles as per normal. 2) Position left foot on the left pedal at its lowest position. 3) Push-start the bicycle until cruising speed, like what they do in skate boarding. 4) Lift the right leg and thread it through the triangular opening below the horizontal bar, and start pedaling with the right foot as well. Thus, the position of the rider is very awkward, and it was quite dangerous. This is especially so when you consider that the bicycles those days were often the bulky and heavy goods delivery type. One of my colleagues told me that he remembers using the right hand to grab the horizontal bar, and steering only with the left hand; as opposed to both hands on the handles. This was probably because his right arm was not long enough to reach the right handle comfortably. Naturally falls and bruises where quite common. But I suppose those days, our skulls and skins were thicker. Mind you, I am not laughing at today’s parents for being over-protective. After all, I too am a parent. It is indeed wise to adopt the proper safety procedure when introducing our kids to something they are not accustomed to. Ours was a different world, you could say. One of my young friends at Yesterday.sg pointed out that my jokes are 'corny'. I am not sure what exactly that means; but I share with you what often happens at dinner table. Whenever I tell a joke, my 3 rascals will, like groan in unison. "Papaaaa ... that is so lame." Well I think all the 'laudies' reading this post will agree with me that the kids should be thankful that their old man is at least around to tell them lame jokes at the dinner table. I understand that many Singaporean fathers, and even mothers don't even eat dinners with their children; to the extent that our government has to run a campaign, with advertisements and all, to remind parents to eat at least 1 or 2 dinners with their children a week. Anyway, I ocassionally, I do get the chance to turn the tables of them. And right now, I am hatching an evil plan to compile all the lamest jokes I can find through the internet and bombard the 3 jokers with them. This week, everybody seems to be blogging about the General Election and James Gomez. I too should join in … sort of. I saw, in the front page of yesterday’s newspapers, JG criticizing his opponents for engaging in ‘politics of distraction’. When I got to the back section, I saw some news about the ongoing Thomas Cup and Uber Cup badminton championships. 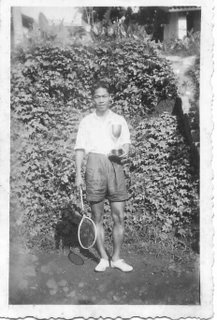 I realized that all the GE news has distracted many sport lovers from the popular sport of badminton, and so I think I should do my part to refocus their attention on badminton by blogging about how we were introduced to the sport of badminton during our kampong days in Lorong Kinchir . Let me begin by asking you a simple question. What is the best time of the day to play badminton? We were introduced to the game of badminton by our 7th uncle, Ng Yook Soon. 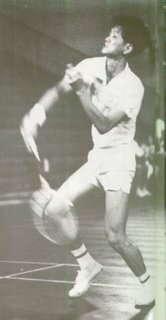 He was in fact one of the top badminton players in Malaya in the 50’s and a contemporary of people like All England champion, Eddy Choong. 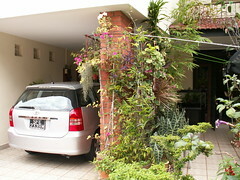 We used to play in front of his house which he converted into a crude badminton court. As it was not possible to paint lines on the ground, what we did was to dig narrow grooves and plant strips of wood to form the lines of the badminton court. Then we painted the surface of the wood white, and voila - you have your badminton court. My younger brother, James, smashing in style. Hey I recognize that tree - its a soursop tree. Wave - that's me. Don't you envy our classic Nike's. In the background is our 7 Uncle' house. As for rackets, the 2 famous brands during that time were Dunlop and Flight Commander. But we couldn’t afford those until much later. I sure was glad to see 2 similar rackets at the Grassroots Heritage Centre recently. Now you know what I was talking about when I blogged about my precious Dunlop Maxply earlier. 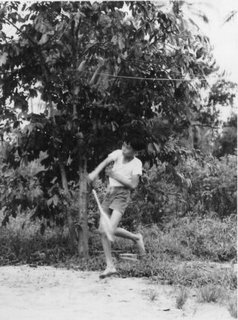 I am shy to say that, in spite of my uncle’s coaching, I never got to be very good in badminton. My younger brother, James was much better. In fact, when I got to secondary school in ACS, I did not even qualify to represent my house. However, when I entered NJC in 1969, I managed to get into the school team. How? Via the back door lor! Here’s how I did it. At first, when I went for the selection trials, I actually did not qualify. But my good friend, Chou Feng, who was also from ACS got selected for the school team. When he saw my disappointment, he ‘invited’ me to join their training sessions. At first I was too embarrassed to do so, but after much prompting, (Don’t care lah! Just join in. Nobody will dare to throw you out one) I did one of the bravest things in my life. I ‘kar-kar’ gate-crashed, joined in their training. When our coach, Mr Seah Lye Huat first saw me, he gave me a puzzled look. But fortunately, he did not pursue the matter, and I remained on the team as a doubles reserve. My partner was a crew-cut, Chinese stream guy by the name of Heng Chye Kiow. Today, I understand he is a VIP in transport giant, Comfort Delgro. (not the sort of ‘VIP’ that Dr Tan Wee Kiat wrote about in NJC69Net, Issue no. 3 - Very Impotent Person. Haha). On occasions when we were up against the weaker opponents, Chye Kiow and I were given the opportunity to ‘kick some butts’. I remember the tough training under Mr Seah who was a former Thomas Cup player. I think he was from Bartley Secondary School. Besides lots of skipping and running, we, the doubles players had to perfect our low service. To achieve that, he made us serve repeatedly to this guy in our team called Ng Chor Yau. In case you do not know, he was in the Singapore national badminton team at that time (maybe national champion even). Every time, we served a little too high – WHAM! You can get the picture I think. I don’t remember much else about those days, except one time when Mr Seah brought us to the famous Kuok Road hawker centre for dinner after evening training. Another memorable occasion was when we participated in the parade at the official opening of the college. 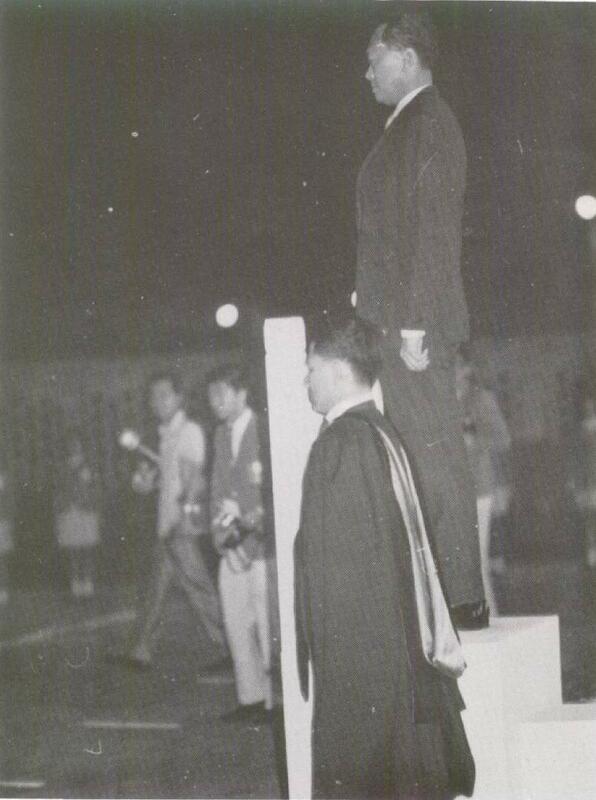 I remember proudly putting on our gaudy red blazer and being inspected by PM Lee Kuan Yew himself. I had wanted to blog about this for a long time, but was too lazy to sit down, dig out the old photos, scan them and write down the details. What finally got me to overcome the inertia was not the general elections, but a (virtual) meeting with a former NJC teacher, Dr Tan Wee Kiat who recently joined our Friends of Yesterday.sg group. Welcome to the blogosphere, Dr Tan.